The Military Leadership Excellence Award in Third Year is awarded to the ROTP/RETP cadet attaining the highest standards of proficiency in each of the four components in the Third Year of the RMC programme. The Howard B. Ripstein Award of Excellence in Third Year is awarded to a cadet of each of the Navy, Army and Air Force elements who has completed the third year of undergraduate studies and has demonstrated excellence in all four components of the Royal Military College of Canada programme. The Capt Matthew Dawe Sword is presented annually by the Dawe family to the OCdt deemed to be the best ROTP combat arms Officer Cadet in Fourth Year. Capt Dawe was killed in action in Afghanistan on the 4th of July 2007. The sword will be presented Sunday on the Memorial Arch parade. The Capt Nichola Goddard Sword is presented to the OCdt deemed to be the best ROTP artillery Officer Cadet in Fourth Year. Capt Goddard was killed in action in Afghanistan on the 7th of May 2006, being the first female to die for her country there. The sword will be presented at the CDAI Graduate Student Symposium on 12 October 2017. The Royal Military College of Canada Award for Academic Excellence in Third Year is awarded annually to the student who has obtained the highest academic standing in the Third Year. The Dr. P.F. Fisher Memorial Trophy and Scholarship is awarded to the Third Year Officer Cadet/ Naval Cadet considered most deserving by reason of academic standing and qualities of leadership and sportsmanship. The Frank R. Kossa Army, Navy and Air Force Veterans in Canada United States Unit Scholarship (ANAVICUS) is awarded to the best cadet of Third Year on the basis of personal qualities, academic performance and leadership potential. The J.W. Brown Memorial Medal is awarded to the Officer Cadet/Naval Cadet who obtains the highest academic standing in the Third Year of an Arts programme. 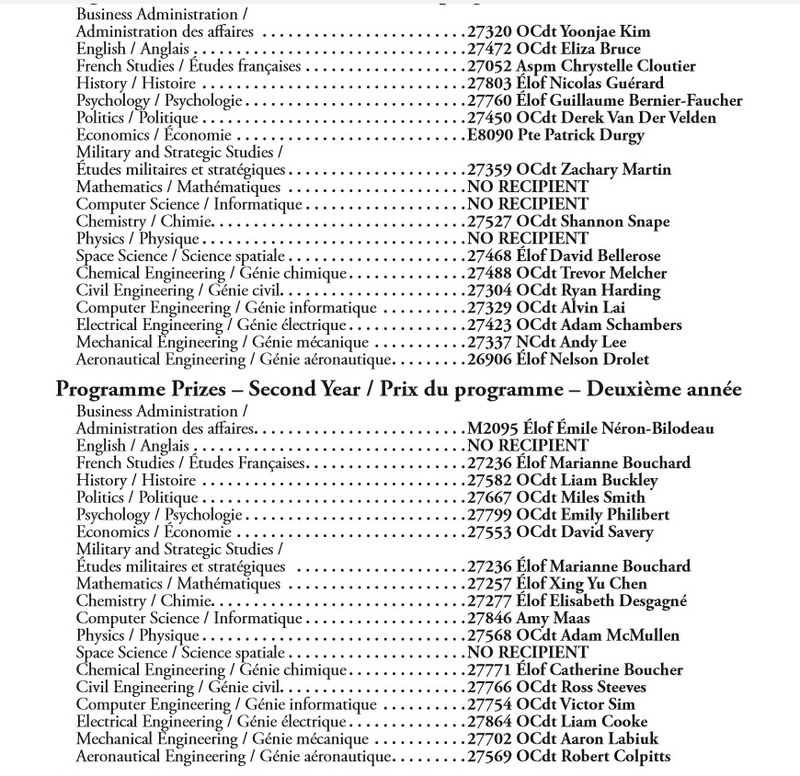 The Ontario Professional Engineers Foundation for Education, Undergraduate Scholarship offers two scholarships, one to undergraduate students for high standing in either the Second or Third Year of an engineering programme, and one to the student who exhibited exceptional role model qualities through participation in non-academic activities while maintaining above average marks. The UTPNCM Drill and Physical Education Prize is awarded to the University Training Programme – Non-Commissioned Member (UTPNCM) Officer Cadet/Naval Cadet not in the graduating year who achieves the highest standard in drill and physical education in the year. The Squadron Leader McAlpine Cadet Trust Fund is awarded to an Air Force Officer Cadet in the Third Year, with achievement in the bilingualism component. The Strong Challenge Shield is awarded to the Officer Cadet/Naval Cadet of the Third Year attaining the highest physical fitness score in the RMC Physical Fitness Test. The Military Leadership Excellence Award is awarded to the ROTP/RETP Officer Cadet/Naval Cadet attaining the highest standards of proficiency in each of the four components in the Second Year of the RMC program. The Royal Military College of Canada Award for Academic Excellence is awarded annually to the Officer Cadet/Naval Cadet who has obtained the highest academic standing in the Second Year. The Class of 1942 Memorial Trophy is awarded to the best all-round ROTP/RETP Officer Cadet/ Naval Cadet of the Second Year in academic standing, leadership and sportsmanship. The Royal Canadian Air Force Women’s Division Scholarship (RCAF) is awarded to the Officer Cadet/Naval Cadet entering the Third Year of a four-year degree program on the basis of high scholastic achievement and outstanding personal qualifications. The Squadron Leader McAlpine Cadet Trust Fund is awarded to an Air Force Officer Cadet in the Second Year, for achievement in the military component. The Grant Prize is awarded to the Officer Cadet/Naval Cadet in Second Year attaining the highest physical fitness score in the RMC Physical Fitness Test. The Military Leadership Excellence Award is awarded to the ROTP/RETP Officer Cadet/Naval Cadet attaining the highest standards of proficiency in each of the four components in the First Year of the RMC programme. The Royal Military College of Canada Award for Academic Excellence is awarded annually to the Officer Cadet/Naval Cadet who has obtained the highest academic standing in the First Year. The Howard B. Ripstein Award of Excellence is awarded to an Officer Cadet/Naval Cadet of each of the Navy, Army and Air Force elements who has completed the first year of undergraduate studies and summer training and has demonstrated excellence in all four components of the RMC programme. The C. Raymond Grandy Memorial Scholarship is awarded to the best Officer Cadet/Naval Cadet entering Second Year at RMC as determined by academic standing, leadership potential, and overall performance in the First Year. The Queen’s University Challenge Shield is awarded to the best all-round ROTP/RETP Officer Cadet/Naval Cadet of the First Year in academic standing, leadership and sportsmanship. The Squadron Leader McAlpine Cadet Trust Fund Award is awarded to an Air Force cadet in the first year, with achievement in the athletic area. The Fulton Award is awarded to the Officer Cadet/Naval Cadet in First Year attaining the highest physical fitness score in the RMC Physical Fitness Test. The Ontario Professional Engineers Foundation for Education provides two entrance awards to Grade 12 graduates entering an accredited RMC engineering programme. The Hope Medallion is awarded to the recruit showing best potential of leadership during the First Year Orientation Program. The Capt John Bart Teamwork awards are supported by an endowment fund created by 6513 John Bart. These prizes will be awarded to the First Year flight that wins the Obstacle Course. All First Year Officer Cadets/Naval Cadets in this winning flight will be hosted to a dinner at a later date where they will be presented with individual medals. The name of the winning flight will also be included on a plaque displayed in the Cadet Dining Hall. Le prix d’excellence en leadership militaire est décerné à l’élève-officier/aspirant de marine du PFOR/ PFIR qui atteint les normes de compétence les plus élevées dans chacune des quatre composantes du CMR au cours de la troisième année au CMR. Le prix d’excellence Howard B. Ripstein est décerné à un l’élève-officier/aspirant de marine de la Marine, l’Armée de terre et la Force aérienne qui a terminé sa troisième année d’études de premier cycle et a démontré de l’excellence dans les quatre composantes du CMR. L’épée Capitaine Matthew Dawe est présentée à l’élof reconnu comme étant le meilleur élève-officier des armes de combat en 4ième année du PFOR. Le capitaine Dawe est mort au combat le 4 juillet 2007 en Afghanistan. L’épée sera présentée dimanche à l’occasion de la parade de l’Arche commémorative. L’épée Capitaine Nichola Goddard est présentée à l’élof reconnu comme étant le meilleur élèveofficier d’artillerie en 4ième année du PFOR. Le capt Goddard est morte au combat le 7 mai 2006, devenant la première femme à mourir pour son pays là-bas. L’épée sera présentée au 19e Symposium de l’Institut de la CAD pour les étudiants diplômés le 12 octobre 2017. Le prix d’excellence du Collège militaire royal du Canada est décerné tous les ans à l’élève-officier/ aspirant de marine qui a obtenu la meilleure moyenne en troisième année dans la composante universitaire. Le trophée commémoratif et bourse Dr. P.F. Fisher sont décernés à l’élève-officier/aspirant de marine de troisième année le plus méritant en raison des résultats qu’il a obtenus dans ses études, et de ses qualités de leadership et de sportif. La bourse de l’unité des anciens combattants de l’Armée de terre, de la Marine et de l’Aviation du Canada et des Etats-Unis (ANAVICUS) est décernée au meilleur élève-officier/aspirant de marine de troisième année du point de vue des qualités personnelles, du rendement universitaire et des aptitudes au commandement. La médaille commémorative J.W. Brown est décernée à l’élève-officier/aspirant de marine qui obtient la meilleure note en troisième année d’un programme d’arts. La bourse d’études des ingénieurs professionnels de la province d’Ontario décerne deux bourses, une à l’élève-officier/aspirant de marine qui a obtenu les meilleurs résultats dans ses études du premier cycle, en deuxième ou en troisième année d’un programme de génie, et l’autre à l’élève-officier/ aspirant de marine aux qualités exceptionnelles qui a été un modèle de comportement dans les activités parascolaires, tout en conservant des notes supérieures. Le prix d’exercice militaire et d’éducation physique du PFUMR est décerné à l’élève-officier/aspirant de marine dans le Programme de formation universitaire-militaires du rang (PFUMR) qui n’est pas en dernière année et qui s’est le plus distingué dans les domaines de drill et de sportivité pendant l’année. La bourse du Fonds fiduciaire des élèves-officiers/aspirants de marine du Commandant d’aviation McAlpine est décernée à un élève-officier de la Force aérienne de troisième année qui s’est distingué dans la composante du bilinguisme. Noordegraaf L’écu-challenge Strong est décerné à l’élève-officier/aspirant de marine de troisième année qui obtient la cote la plus élevée au test d’aptitude physique du CMR. Le prix d’excellence en leadership militaire est décerné à l’élève-officier/aspirant de marine du PFOR/ PFIR qui atteint les normes de compétence les plus élevées dans chacune des quatre composantes au cours de la deuxième année du programme du CMR. Le prix d’excellence du Collège militaire royal du Canada est décerné tous les ans à l’élève-officier/ aspirant de marine qui a obtenu la meilleure moyenne en deuxième année dans la composante universitaire. Le trophée commémoratif de la promotion de 1942 est décerné au meilleur élève-officier/aspirant de marine PFOR/PFIR de deuxième année selon les résultats académiques, le leadership et la sportivité. La bourse d’études du Service féminin de l’Aviation royal du Canada (ARC) est décernée à l’élèveofficier/aspirant de marine qui entre en troisième année d’un programme d’études de quatre ans, qui a un rendement élevé sur le plan universitaire et qui possède des qualités remarquables. La bourse du Fonds fiduciaire du Commandant d’aviation McAlpine est décernée à un élève-officier/ aspirant de marine de la Force aérienne de deuxième année qui s’est distingué dans la composante militaire. Le prix Grant est décerné à l’élève-officier/aspirant de marine de deuxième année qui obtient la cote le plus élevée au test d’aptitude physique du CMR. Le prix d’excellence en leadership militaire est décerné à l’élève-officier/aspirant de marine du PFOR/ PFIR qui atteint les normes de compétence les plus élevées dans chacune des quatre domaines d’études au cours de la première année du programme du CMR. Le prix d’excellence Howard B. Ripstein est décerné à un élève-officier de la Marine, l’Armée de terre et la Force aérienne qui a terminé sa première année d’études de premier cycle et entraînement d’été, et a démontré de l’excellence dans les quatre piliers du programme du CMR. La bourse commémorative C. Raymond Grandy est décernée au meilleur élève-officier/aspirant de marine qui entre en deuxième année au CMR; le candidat est choisi d’après les notes obtenues dans ses études, ses aptitudes de leadership et rendement d’ensemble en première année. L’écu-challenge de l’université Queen’s est décerné au meilleur élève-officier/aspirant de marine PFOR/PFIR de première année à tous les points de vue : études, leadership et sportivité. La bourse du Fonds fiduciaire du Commandant d’aviation McAlpine est décernée à un élève-officier de la Force aérienne de première année qui s’est distingué dans le domaine athlétique. Le prix Fulton est décerné à l’élève-officier/aspirant de marine de première année qui obtient la cote la plus élevée au test d’aptitude physique du CMR. Deux bourses de début d’études décernées par The Ontario Professional Engineers Foundation for Education à des étudiants qui ont réussi leur 12ième année et qui s’inscrivent à un programme de génie agréé du CMR. Le Médaillon Hope est décerné à la recrue démontrant le meilleur potentiel d’aptitude de commandement durant le Camp des recrues. Le prix du travail d’équipe du Capitaine John Bart est supporté par un fonds de donation créé par 6513 John Bart. Ce prix sera décerné à l’escadrille de Première Année qui gagnera la course à obstacles. Tous les élèves-officiers qui font partie de l’escadrille gagnante seront reçus lors d’un dîner à une date ultérieure et une médaille individuelle leur sera remise. Le nom de l’escadrille gagnante verra son nom inscrit sur une plaque située dans la salle à manger des élèves-officiers. Le prix de leadership Capitaine John Bart est décerné au meilleur leader dans chaque escadron durant la course à obstacles. Le prix est déterminé par un vote entre les Premières Années, immédiatement après la course à obstacles. Le gagnant de chaque escadron sera invité à un dîner organisé à une date ultérieure. À ce moment-là, ils recevront tous une médaille. Len Lee & Britt Smith added to the WoH: Big time event!